It’s good to see things in a way you can understand better. If your native language is other than English, you may feel a bit uncomfortable to cope with a lot of things. However, Microsoft takes good care of people who speak other languages than English and allows you to change the language. Open the ‘Region and Language’ window from Control Panel or simply type ‘change display language’ in the Windows search box that you get by clicking on Start button. Switch to ‘Keyboards & language’ tab at the top. Click the ‘Install/Uninstall Languages…’ button. Click Install to download the language packs on the Install or uninstall display languages wizard. A prompt window asks to select the location of the Language packs with two options, Launch Windows Update or Browse computer or network. You can select Launch Windows Update unless you have a language pack stored on PC. Click on the ‘X optional updates are available’ option (X à no. of updates) over the Windows Update window and manually select the language pack you wish to download. The ‘Select updates to install’ screen loads a list of available updates that are Important and Optional. Click on Optional in the left-most. Select the language with check mark next to the language pack on the list from the Windows 7 Language Packs section. Click on ‘Install updates’ button on Windows Update screen. Once the installation is completed, it is made available for use. Return to the ‘Region and Language’ screen, select the language you downloaded from the Choose a display language drop-down menu. After making all necessary changes, you need to log off from your computer and log back in. Once you do that, you can see changes as every text will be in your desired language. 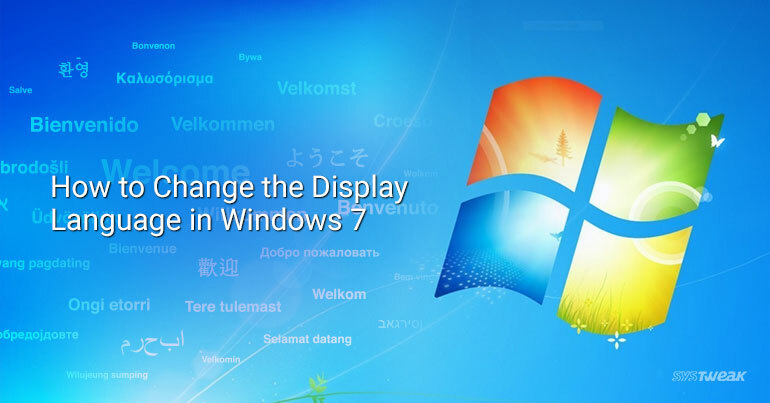 If you want to make English as your primary language, just select it from the drop-down list to change the display language in Windows 7.